This month, Melissa will sponsor an international urban art festival right here in El Barrio and the South Bronx entitled “Los Muros Hablan NYC.” This weeklong festival, which involves the simultaneous painting of murals throughout the community, is based on a similar festival held annually in Puerto Rico. This first-time event in New York City will be held from August 19th through August 25th. Melissa is sponsoring the event in conjunction with El Museo del Barrio. While additional details are still forthcoming, one of the artists, Viajero, will hold a community conversation this Wednesday to gather ideas that will inform the design of his mural. All of the new murals will be designed around the common theme of “diaspora.” Next week’s meeting will give us the opportunity to share what diaspora means to all of us. 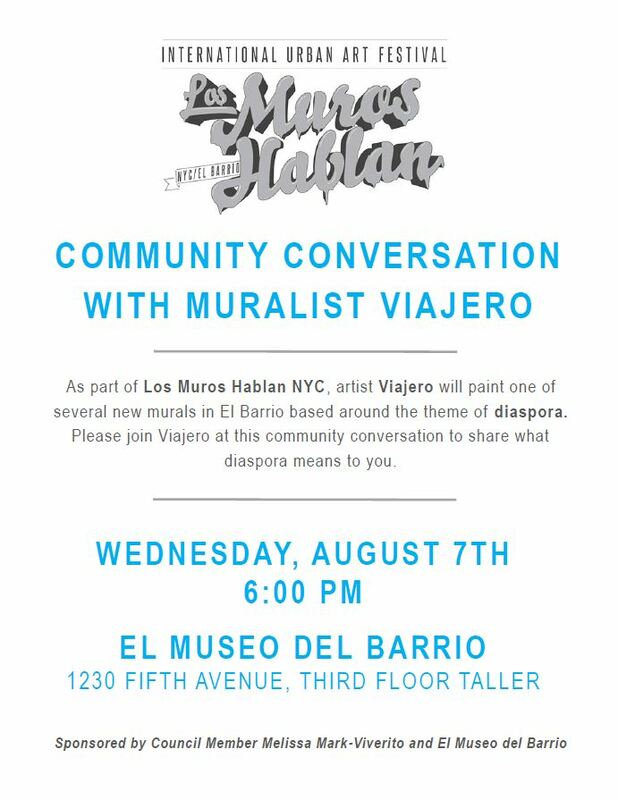 Please join us at El Museo’s Third Floor Taller on Wednesday, August 7th at 6:00 pm!